WSF used to operate on occasion through Pole Pass - not sure what the exact reasoning was. It could be to shave a few minutes off en route to Sidney. Wasp Pass isn't all that wide, either. Could they have been trying to avoid meeting another ferry or large vessel coming the other direction in Wasp Pass? 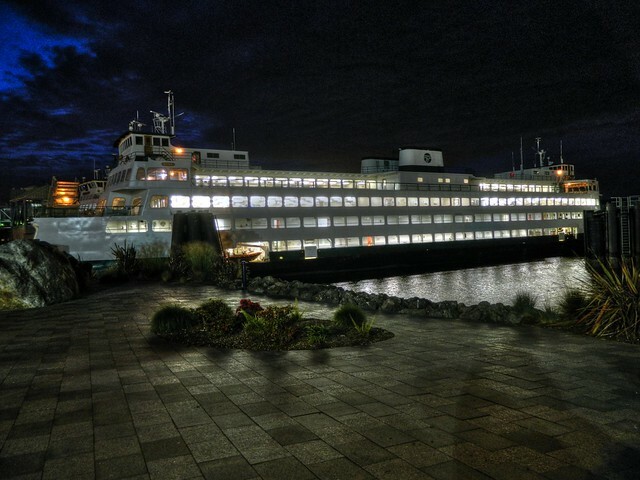 Here is an oldie of the WSF M/V Kaleetan from 1976 at Sidney, B.C. Is that window washing that I see in progress? Photo © JST - taken on 27 September 1976. This is from my Flicker Site. Scanned from a Fujichrome slide using ViewScan software and my Nikon CoolScan V ED. Indeed it is! The act is oh-so-familiar to me (though I suspect there were no safety belts in the picture then). I never knew the Kaleetan was on the Sidney run back then. Does she ever do the San Juans??? I really would like to do a trip on the Kaleetan now. From about 1973 until she was refurbished in 1997 she was mostly in the San Juans. She would rotate out on the Kingston run now and again, but she spent the majority of her time in the Islands. 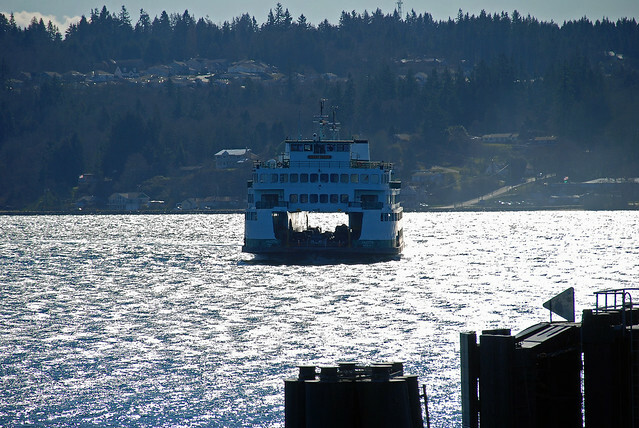 Since the MLU, she's been dividing her time between the Islands in the summer and the Bremerton run the rest of the year. It appears to me that they've cleaned the windows! The last time I took photos of it (the day I took my crossing) the windows were absolutely horrible to see out of. It was like they had a salty, grimy residue on them. I have a black-and-white original from 1968 of the Kaleetan. Bought it at an antique store. Has been in a frame most of its life. 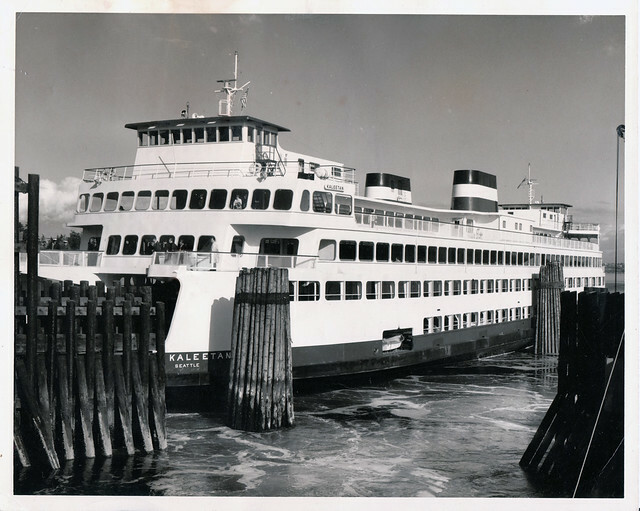 It may have been in the fall of 1973 when the KALEETAN became top ferry in the San Juans. 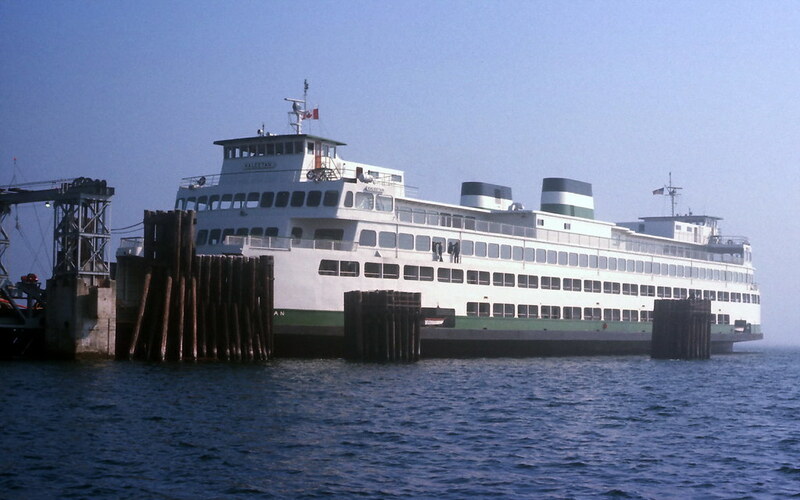 The new WALLA WALLA entered service in the San Juans in the summer of 1973 and joined the EVERGREEN STATE, KLICKITAT, and NISQUALLY there that year. 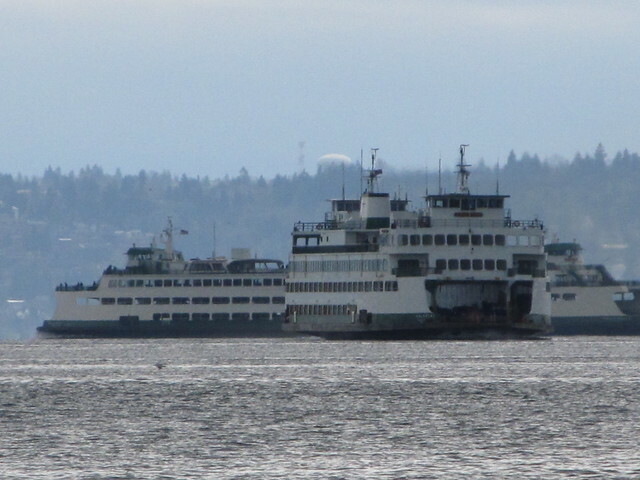 The VASHON would leave the San Juans and join the KULSHAN and RHODODENDRON at Columbia Beach. 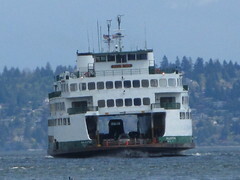 The Columbia Beach third ferry OLYMPIC would eventually make her entrance on the Keystone run, newly acquired by WSF. 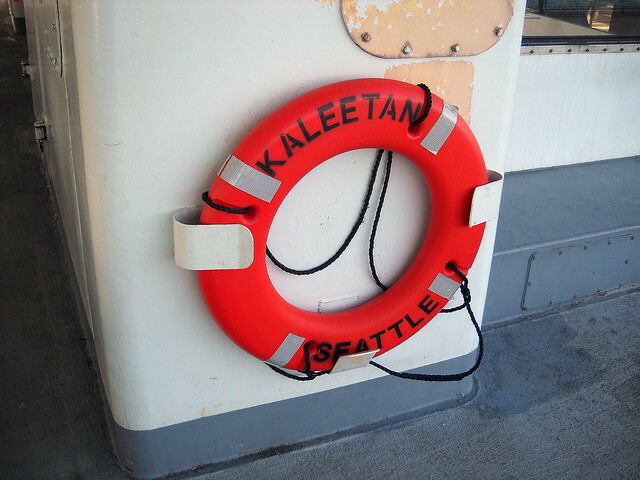 The KALEETAN was bumped from the Winslow run by the new SPOKANE in the spring of 1973 and went to Kingston to be with the ILLAHEE for the summer. 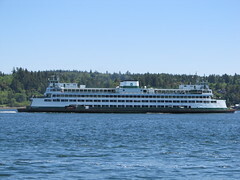 The KALEETAN sent the then top Kingston ferry TILLIKUM to Vashon Island to be with the KLAHOWYA and QUINAULT. After the summer of 1973, the WALLA WALLA went south to Winslow to join her sister SPOKANE. 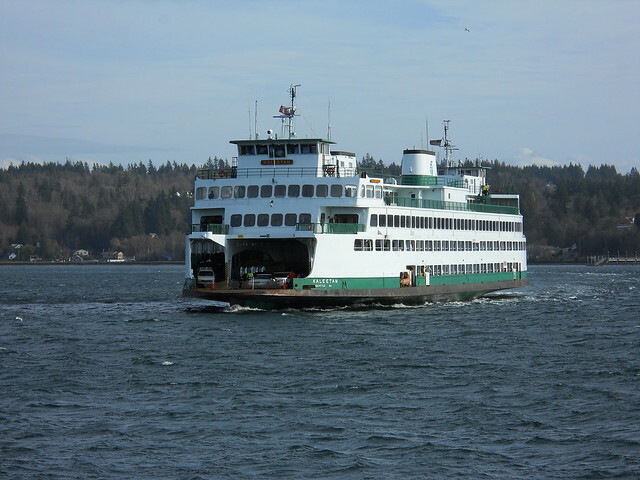 She replaced the ELWHA there and that one went to Kingston to join the ILLAHEE. 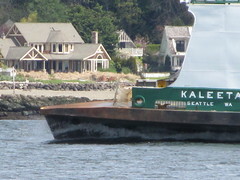 It was after that move when the KALEETAN became top ferry in the San Juans. After spending one summer on the Kingston run with the ILLAHEE in 1973, the KALEETAN went north to the San Juans to be with the EVERGREEN STATE, KLICKITAT, and NISQUALLY. These four would be serving the San Juans until programs changed in 1978 when the VASHON returned to the San Juans to do inter-island runs and the NISQUALLY went south to Kingston to join the ELWHA. 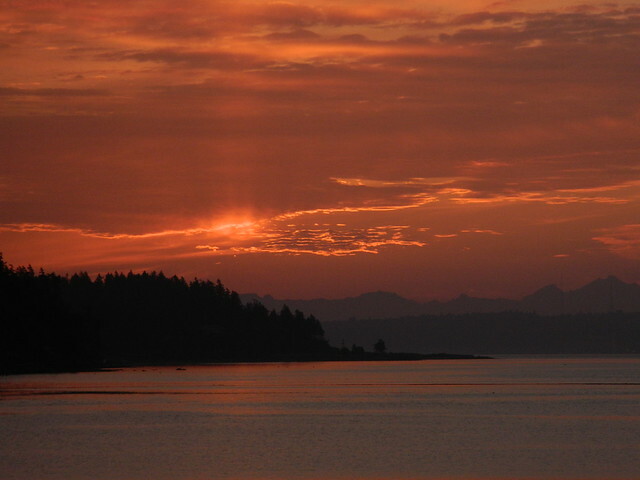 The ILLAHEE went to Columbia Beach to join the KULSHAN and OLYMPIC there. The RHODODENDRON went to Keystone. 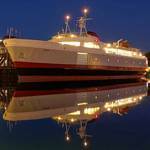 So many changes have occurred through the WSF fleet through the years. Not sure if I've asked this, but how exactly is Kaleetan pronounced? An alternate pronunciation is something like "shipthatsconstantlyphotographedbysteve". Those are excellent photos! I saw them on your Flickr photostream, and I've been browsing through some of your pix of the Kaleetan. 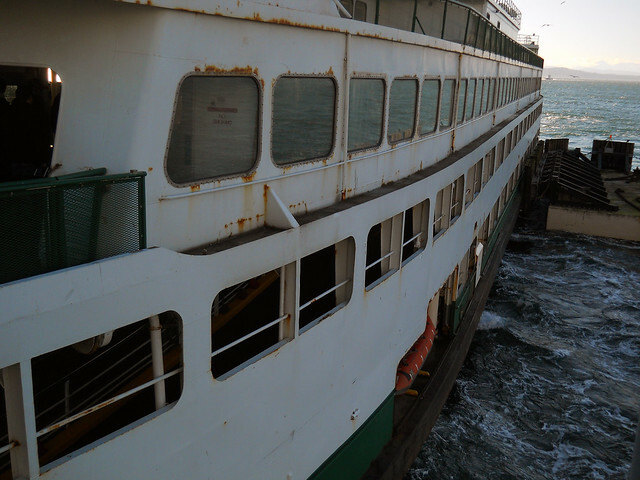 By the way, I'm now the new "Captain" so to speak of the Flickr group "WA State Ferries." I moved away from the Bremerton area a month ago (started a new job in Olympia) so I haven't been over to photograph the ol' girl as much as I'd like. Especially seeing as how I just got a pretty expensive Nikon camera, too. 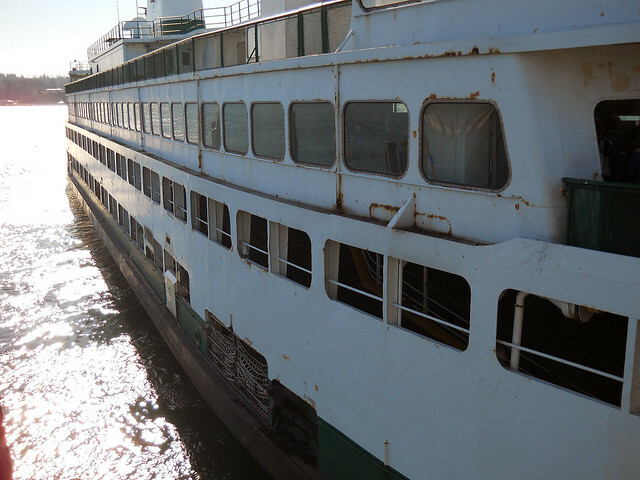 I hope to make it over there in May, because according to the current maintenance schedule, the Hyak is supposed to join the Kaleetan on the Sea/Brem run on the 1st. 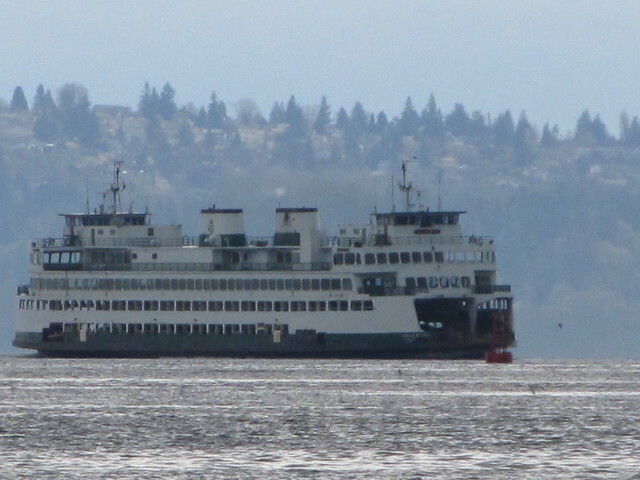 Nice...It is always neat to have two supers on the route (I would love to see the Hyak and Yakima paired once again though...At least now both the Supers will be white again since the Hyak dropped her Staten Island Ferry color ;D ). I have had a lot of extra time to go and get photos, as I am not working right now. It is an awesome little break from life! 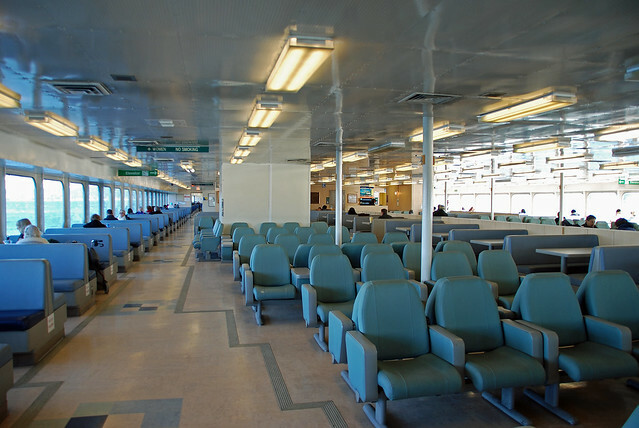 (Except for the part about not commuting on the ferries anymore). Getting a chance to organize and update a bunch of photos and take new ones. 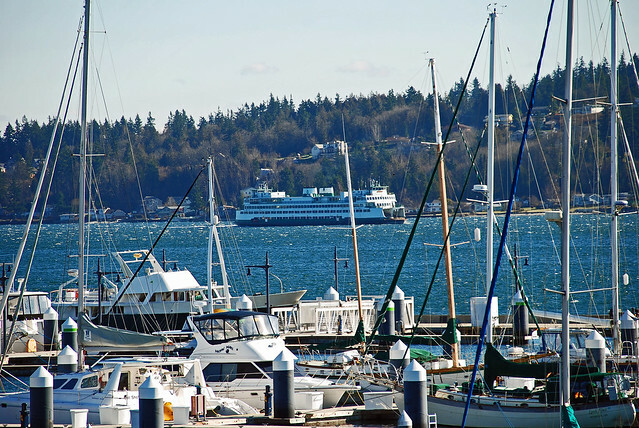 I go over to Seattle quite a bit to explore, I just have not been using the ferries because I found how much I like the Sounder train from Tacoma to Seattle. When it's not running, the bus goes every 30 minutes...That's a lot more frequent than the ferry . Anyways, I really like going down to Manchester to get some photos. I really want to get a good shot of the Kaleetan listing (as she so often does when turning...or whenever she feels like it ). I got a couple with the digital zoom on my camera, but that is too grainy for my liking . 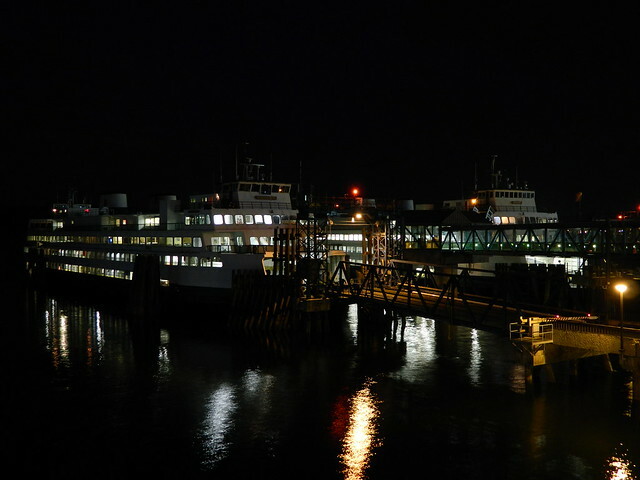 Super Ferries at Bremerton work out good all around. 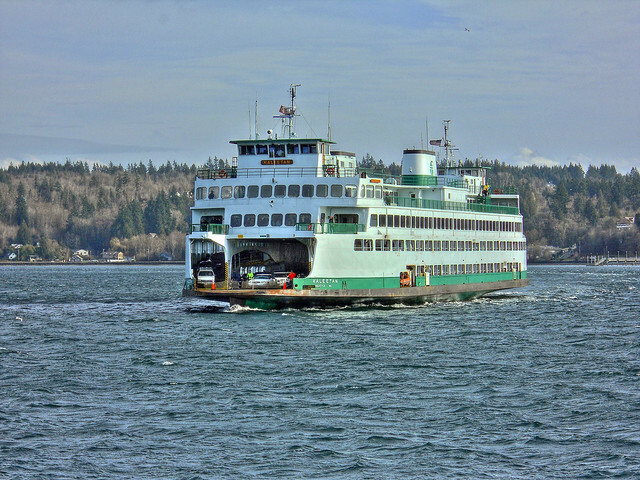 They keep commuters happy (er...the Kaleetan and Yakima do...The Hyak-well, there is the space minus the comfort) and they create a low enough wake to not slow down through Rich Passage. Steve Rosenow: That traffic signal collection on your Flickr page is awesome. Thanks! Been collecting for about a decade now. As for the Kaleetan, I *hope* to make my way over there next week. If all goes well, that is. A new photo of the Kaleetan! Er, nevermind, an old photo revisited, in a new light! Recently I discovered the wonders of HDR photography after purchasing my new Nikon, and I've been revisiting some of my older works and turning some of them into HDR shots. Grabbed some impressive sunrise photos, too! 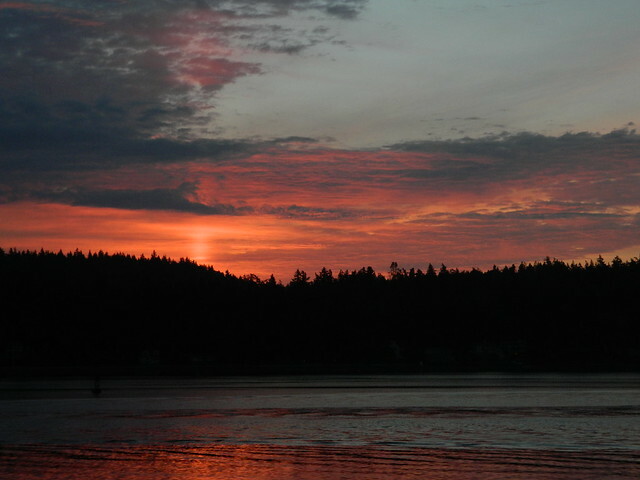 These were taken from the sun deck of the Kaleetan as we were going through Rich Passage. In all, this was worth staying up for! Nothing beats that sort of sunrise! (I also have more photos of that sunrise on my Flickr, feel free to check them out! I also can't post an embedded video, but here's an HD video I took at the same time I took the photos. www.flickr.com/photos/rosenow_photography/5806997813/. You'll see No. 2 End of Kaleetan in it. 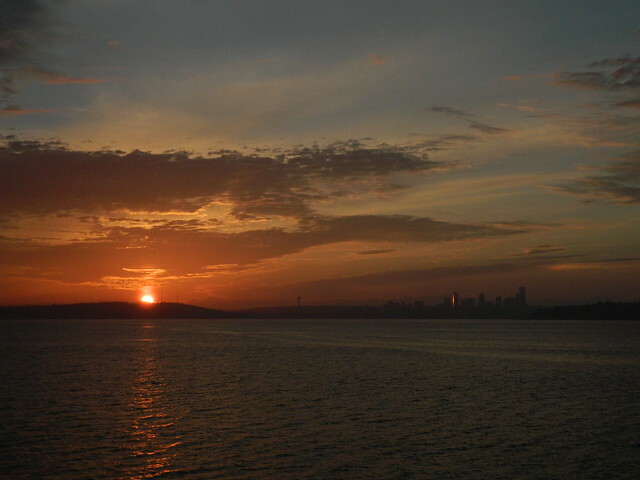 I love those sunrise photos...Beautiful! Very neat to see both boats tied-up at Bremerton together. I was looking real close at the original size of a photo of the Kaleetan that I just took. I think that now would be a really good time for WSF to secure funding to do some painting. There are pieces flaking off and some rust that's starting to make it's presence known. It would be really nice if boats that started showing these signs could get patchwork done in those areas. 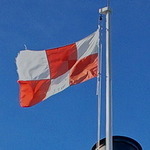 The whole boat does not need to be painted, just the affected areas before they spread. It seems like every once in a while a patch job will be done on a boat, but not too often. I understand that there are budget issues, but It would seem to make sense to take the boat out now and do some patch painting for a little bit of $$ vs. waiting until the boat is no longer white and paint the whole thing for a whole lotta $$$$. It's worse on the other side. What you see in the photo you posted is largely just huge patches of flaking paint. The heaviest rust on that side is confined to the rescue boat alcove (the cutout where it had been expanded to house the larger Welin davit). On the other side of the Kaleetan, the rust is much worse. 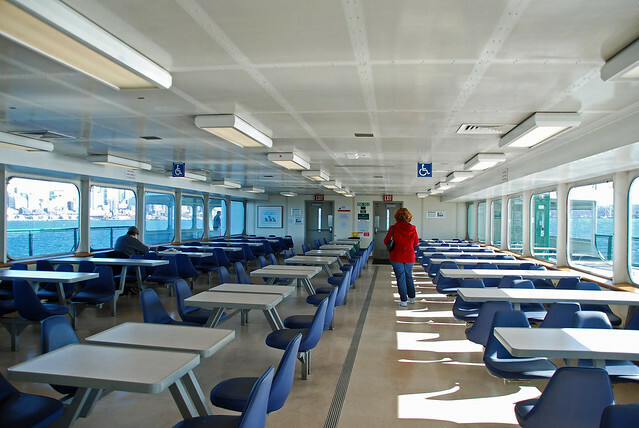 Especially at the seams of the steel @ the passenger cabin level adjacent the area of the lower shelter @ No. 2 End. I did notice that some of the paint had been apparently touched up on it, however. On one of my previous photos I took, the entry to the lower shelter @ No. 1 End on the starboard side had huge patches of flaking/missing paint. (seen below:). They've touched it up it seems. Unless I was looking at No. 2 End, LOL. The huge patch on that small access panel is still present. 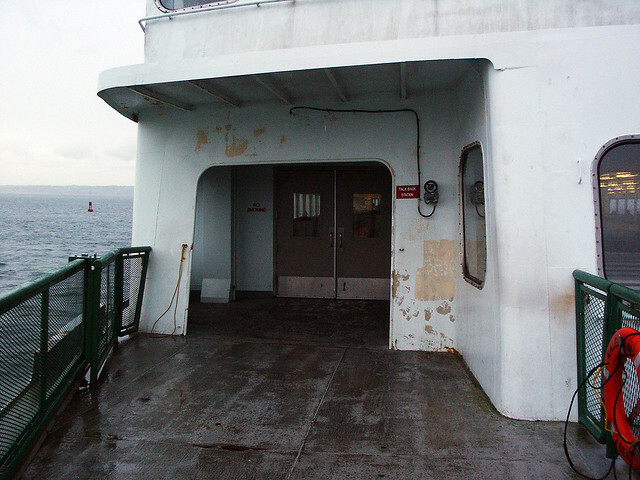 That whole bulkhead is rife with large patches of missing paint. That's taken from the Bremerton overhead walkway, and this one is taken from the Seattle side, but it's the same side of the vessel. Oh, and a little trivia. 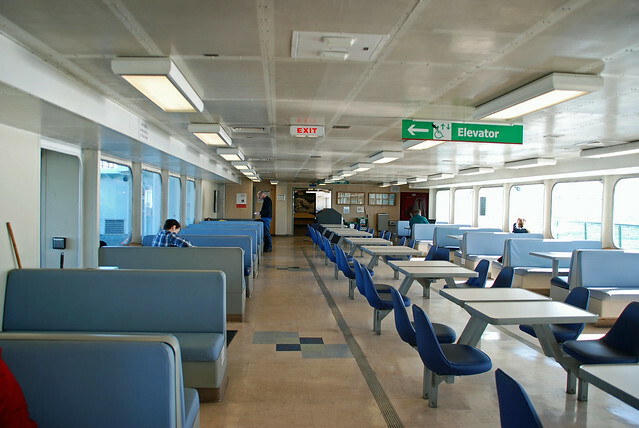 The boat davits on Washington State Ferries (Welin/Lambe) are manufactured by the same company that produced the lifeboat davits on all White Star Line ships, including the famed Olympic Class (for which the ill-fated R.M.S. Titanic was a member of). Going back to a gem I posted here earlier, I finally got around to scanning it in and restoring it. Of course, original copyright retains with the original photographer (who at this point remains a mystery), but here ya go. I present, the M/V Kaleetan, as she was when new, in 1967. That's a great photo. I'm pretty sure that shot was taken at Winslow, Bainbridge Island. I paid $15 for it at an antique shop in Port Angeles. It was sitting out on a glass display case in a slightly warped picture frame that I've since re-bent back into shape. All I need now is a new backing. When I print the restored photo, the original is going into a safe (eventually) and the new one will go into the frame. The original had rust bleed-through on it in the area of the picklefork railing due to the hinge on the frame backing rusting out. The original size of the photo is close to an 8x10. It's got a lot of detail in it. 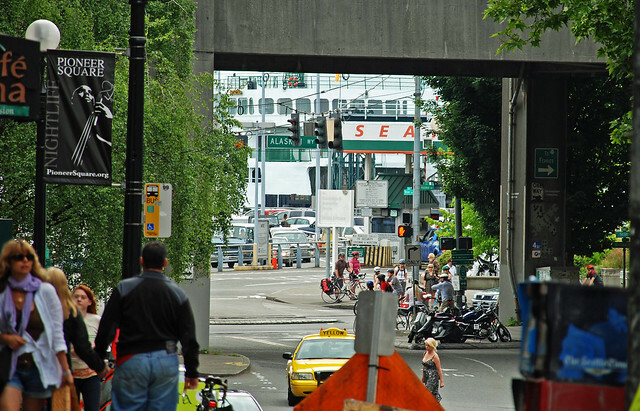 A peek-a-boo view of Kaleetan from 1st and Yesler in Pioneer Square. There's a lot in this photo, and you don't see much of the vessel, but it's kind of neat in how it captures many of the elements around the ferry terminal in Pioneer Square.